High impact resistant plastic cover. Attaches to Herman Miller “E” Series metal bases. 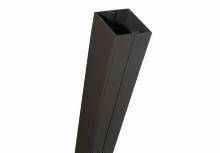 Two raceway covers are needed per base (sold individually). Hollow extruded rigid PVC hollow pole in HM colors. Use as closure for Ceiling Power Feed or Communications cables. Available in 11 ft. lengths only. HM finishes DT, MT, HT, LT, LN, LG. 24″Pent powered, AO2 8-wire / 4-circuit, harness is used for converting a non-powered panel into a powered application. This will work with Herman Miller’s Series 1 power. Pent power is UL (Underwriters Laboratories) approved. Two receptacles can be attached to each side of the 24" harness (M.0847 sold separately). This harness works with the M.0236.24 powered raceways (sold separately). lengths only. HM finishes DT, MT, HT, LT, LN, LG. Used to bring power from the ceiling of a building, through a telecom pole, to the panel unit. A licensed electrician is responsible for connecting the feed to the power box in the ceiling. This item is UL (Underwriter’s Laboratories) recognized. 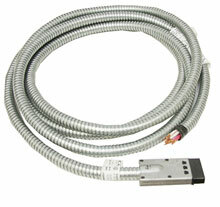 This ceiling feed is 144 in length, AO2 8-wire / 4-circuit, and works with E series.